June 15 th 2015 is the 800th anniversary of Magna Carta! That is to say the anniversary of King John agreeing to attach his Royal Seal to the historic document. To be honest, the term Magna Carta (great charter) may be more significant to your average American than your average Brit. But I suspect there will be plenty of media attention in the UK and perhaps we will trawl up memories of mostly forgotten history lessons….What’s the fuss, was King John really so bad and why might our American cousins be more enamoured of this anniversary than we can truthfully admit? And what on earth do lampreys have to do with it? 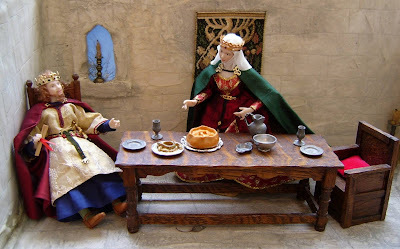 King John and his second wife Queen Isabella by Angeliqueminiatures, about to set upon their lamprey feast! King John was not a good man, not at least according to A A Milne (he of Winnie-the-Pooh fame) in his poem written in 1927. In this enchanting verse we grow to feel sorry for King John as he anticipates no presents again in his stocking at Christmas! Whilst all the time he really does want a big, red, India rubber ball. Charming and anachronistic, I had a copy of Milne’s poetry anthology “Now We are Six” on a suitable birthday! Why did people revile him? England's crown passed to "bad" King John (1167-1216) on the death of his brother, Richard so-called Lionheart. John had earlier tried to “usurp” the crown while Richard was away doing what he liked best, fighting battles overseas. So he wasn’t trustworthy then. The mighty Barons of England’s shires saw that John abused his power as monarch. Through his outrageous behaviour John had managed simultaneously to alienate all three orders of Medieval society in his realm. First, the powerful nobility - the barons and lesser nobles. Second, the Church - for six years of his rule the Pope ordered churches to be closed and finally he excommunicated John. And last, the remaining 90% of the population, John’s unfair rulings had alienated the peasants. Exasperated the Barons took London and invited Prince Louis, heir apparent to the King of France, to rule England. John was at Windsor Castle and both factions met at Runnymeade on the River Thames to negotiate terms. Such was their mistrust, the Barons were not going to let him leave without signing. On 19 June 1215, with the Seal presumably affixed by court officials, the Barons then finally swore their allegiance to John. 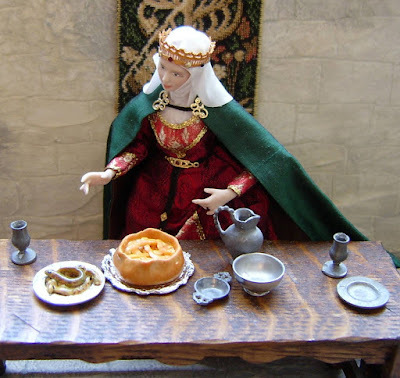 Louise Goldsborough Bird creates historically accurate 12th scale dolls, MedievalMorsels can supply their favourite foods! Magna Carta was without precedent, drawn up to protect all “free” men by calling on the law, and fair judgement by equals (a jury as we would now say). And no longer to be subject to the whim of the power crazed, autocratic and selfish King John. Clause 39 states that “No free man is to be arrested, or imprisoned, or disseised, or outlawed, or exiled, or in any other way ruined, nor will we go against him or send against him, except by the lawful judgment of his peers or by the law of the land.” The "villeins" or unfree tenants were excluded, technically they fell within the jurisdiction of their lords. In essence most of Magna Carta’s 63 clauses granted by King John, under duress he would later argue, dealt with specific grievances relating to his rule. The Barons sought to make the despotic King John subject to the law of the land, but within three months of attaching his seal John petitioned the Pope for its anulment. After John’s premature death however the Baron’s swiftly resurrected an updated Magna Carta. Although nearly a third of the text was deleted or substantially rewritten within ten years, and almost all the clauses have been repealed in modern times, Magna Carta remains a cornerstone of the British constitution. Some of Magna Carta’s core principles, Clause 39 in particular, are echoed in the United States Bill of Rights (1791) and in many other constitutional documents around the world, as well as in the Universal Declaration of Human Rights (1948) and the European Convention on Human Rights (1950). The same King John loved to eat lampreys, eel like fish which happened to be a favourite dish of earlier English Royal courts. Some centuries before, King Henry I (1068-1135) was also known for his lust of eating them, reportedly dying from a "surfeit of lampreys" as one chronicler elegantly put it. This befell that particular monarch on a hunting trip to France and since, like most early English monarchs, Henry was really more French than English perhaps a gastronomic death in France was fitting! Most historians believe that he died from food poisoning, but quite possibly it was the lampreys "wot did it ". Well, the same fate befell quite plausibly befell King John. Soon after learning his baggage “train” and its treasure including his crown jewels were lost in the Fenland marshes he too sucumbed to food or some other more sinister poisoning, dying at Newark Castle. Whether his last meal included the exceptionally fatty and highly indigestible lamprey Medieval chroniclers do not say, but I imagine they were easy to trap in the marshes and we know that he often called ahead for such a dish of lampreys to be prepared and even brought out to meet him as he approached a town on his "Royal Progress". 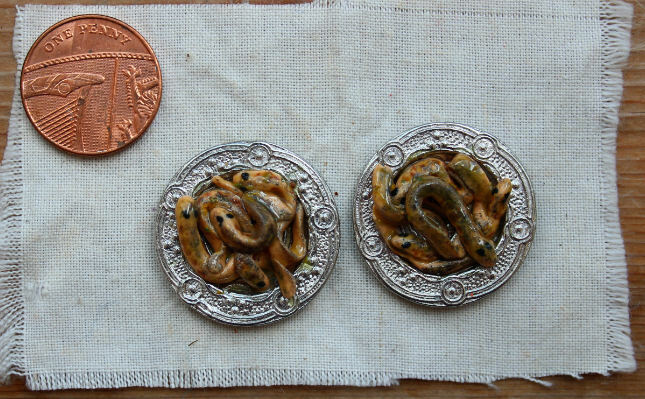 So great was the demand for lampreys during his reign, that John issued a mandate to the sheriffs of Gloucester, where the best were to be found, forbidding the first lampreys of the season to be sold for any more than two shillings a piece. This sounds very expensive indeed! 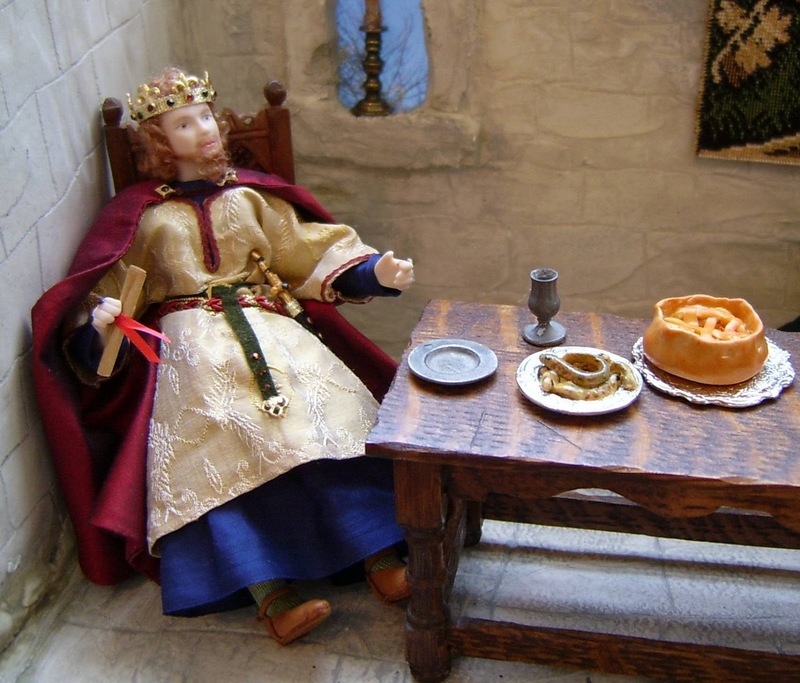 According to the Royal Cookbook, King John also levied a fine of 40 marks (a mark was about two third of a pound) on the city of Gloucester for failing to "pay him sufficient respect in the matter of his lampern." Perhaps they had forgotten him at Christmas?! Or to send a lamprey pie to meet him at the city gate. Embarrassing because his first wife, before acceding to the throne, was Isabella of Gloucester. Perhaps the bad temper levelled at Gloucester really arose because he wanted to divorce her for a younger bride now he was to be King Notably the very beautiful and much younger Isabella Countess of Angouleme, France. Unlike other fish, the lamprey has no scales, jaws, gill covers or bony skeleton. Fossil evidence has shown lampreys date from before dinosaurs, evolving some 250 million years ago and belonging to a near-extinct family of jawless fishes. So now for some unpalatable natural history about the ancient sea lamprey (Petromyzon marinus). A lamprey's downward slanting mouth consists of a large, tooth-lined sucking disc. Once it has latched onto the side of another fish, the lamprey opens a hole in its host by wiping its raspy tongue across the skin. The parasite (because that is what a lamprey is!) then secretes an anticoagulant that keeps this wound open so that the lamprey can feed on the prey's blood and tissue.